OPEN (One Planet Education Networks) aims to mainstream responsible and sustainable business education. A strong turnout from the OPEN community has gathered over 21/22 March in Killeen, TX for the inaugural SUSTEX summit, hosted by our wonderful partners at Texas A&M University-Central Texas. OPEN strategic advisor Thomas Jelley, Vice President of Sodexo, on what gets in the way of sustainability. OPEN Chairman Dr Jody Fry, Professor of Management at TAMUCT, on spiritual leadership. OPEN Fellow Dr Eleftheria Egel on spiritual leadership, as well as on new models of social entrepreneurship. OPEN Strategic Advisor Dr Isabel Rimanoczy, Convenor of LEAP!, the UN PRME Working Group for Sustainability Mindset, on the development of sustainability mindset. OPEN CEO and Co-Founder, Tony Cooke on the changing nature of leadership for sustainability. Our sincere thanks and congratulations to Lucas, Susan and all the team responsible for putting on SUSTEX. It’s been a terrific event, and we look forward to its second edition in 2020! This invitation is reproduced from an HTML e-newsletter from OPEN Fellow, Henry Leveson-Gower, founder of Promoting Economic Pluralism. For those able to get to London on Mar 12, it promises to be an excellent event. This event marks the beginning of a new initiative to use 50 years of Economics Nobel Prize winners to reflect on the impact of prestigious economists on policy and humanity for good and ill. We will be organising an online dialogue including voting, events, webinars and more resulting in a ‘People’s Verdict’. Make sure you are signed up to our newsletter lists here to keep in touch with developments. We know that although economic theory may be speculative, its impact is powerful and real. Since the 1970s, it has been closely associated with a sweeping change around the world—the “market turn.” This is what Avner Offer has called the rise of market liberalism, a movement that, seeking to replace social democracy, holds up buying and selling as the norm for human relations and society. Our confidence in markets comes from economics, and our confidence in economics is underpinned by the Nobel Prize in Economics. Was it a coincidence that the market turn and the prize began at the same time? This and similar questions will be at the centre of a discussion which will also mark the beginning of an exciting new project of Promoting Economic Pluralism. 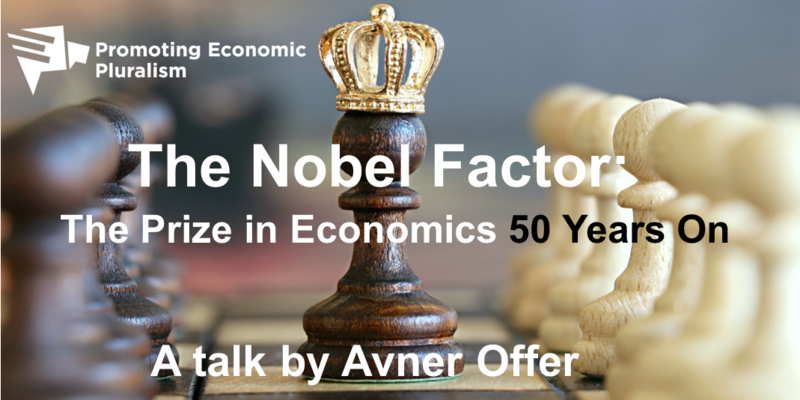 Avner Offer will describe the origins and power of the most important prize in economics, explore this and related questions by examining the history of the prize, the history of economics since the prize began, and the simultaneous struggle between market liberals and social democrats in Sweden, Europe, and the United States. His work draws on previously untapped Swedish national bank archives and providing a unique analysis of the sway of prizewinners, He will offer an unprecedented account of the real-world consequences of economics—and its greatest prize. His presentation will be followed by discussion and then a networking reception with wine and snacks. Avner Offer is Chichele Professor Emeritus of Economic History at the University of Oxford and a fellow of All Souls College and the British Academy. He was educated in Jerusalem and Oxford. Initially he wrote about land tenure and the economics of war, and published Property and Politics 1870-1914(CUP, 1981), and The First World War: An Agrarian Interpretation(OUP, 1989) as well as many articles. Subsequently he focused on consumption and the quality of life with The Challenge of Affluence: Self-control and Well-Being in the United States and Britain since 1950(OUP, 2006) as well as articles and edited books on reciprocity, well-being, working-class experience, and the social determinants of obesity. Currently he is studying the transition from Social Democracy to Market Liberalism. Articles have covered Adam Smith and the invisible hand, the economy of obligation, and the American health system. Another strand investigates the links of finance, homeownership, and household debts and assets. In 2018 he delivered the Ellen MacArthur Lectures in Cambridge on how time horizons define the boundaries between private and public enterprise. The following invitation first appeared in an HTML e-newsletter from Impact Entrepreneur. 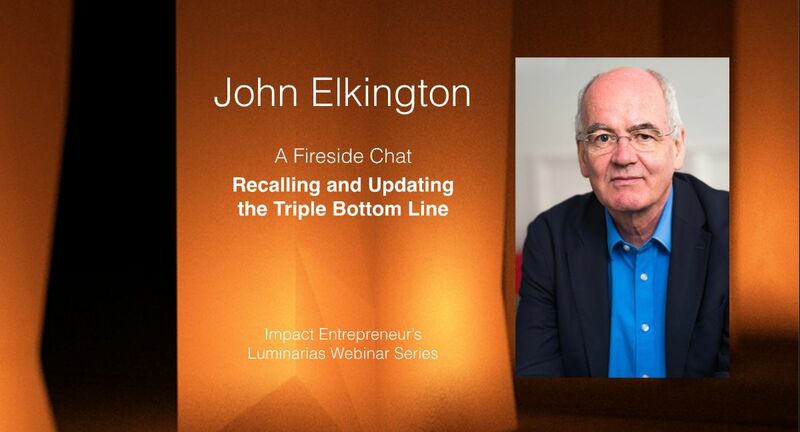 In this live, virtual fireside chat, Impact Entrepreneur’s Laurie Lane-Zucker discusses with Elkington the motivations behind his coining of the TBL concept, his perceived failure of the concept to achieve its intended ends, and how the concept can be updated to effectively leverage the kinds of system change necessary to transform business and contribute to the building of an authentically sustainable impact economy. The following call is reproduced from an HTML e-newsletter sent by GBSN. The role of business in society is changing rapidly, especially in emerging markets. An increasing number of companies, large and small, are adopting notions of shared value creation and taking a larger stakeholder view of the firm. There is agreement that businesses can address social challenges effectively and efficiently in partnership with governments. This view is reflected in the explicit incorporation of business as a change agent in the UN Sustainable Development Goals and the Global Compact initiative. Student attitudes also reflect this shift. More students aim to make a positive impact in the world and are seeking careers that share these values. In this changing context, the question arises of how business schools can assess their relevance and impact in society at large, including a wider range of stakeholders. This central question of impact assessment forms the focal point of discussion in the GBSN 2019 Annual Conference. Lead the conversation around measuring the impact of business schools by preparing a session proposal for the GBSN 2019 Annual Conference. GBSN Membership is not required to submit an application, however special consideration will be given to proposals that include faculty or staff of GBSN Member Schools. Applicants will receive information about the status of their submission from GBSN by April 19, 2019 at which point additional information and interviews may be requested. For questions regarding the conference or application procedures please email Nicole Zefran at nzefran@gbsn.org or call +1.202.628.9040.